What is occupation that looks like “Pre MJ” on 1841 census from Cornwall, England? In the screenshot below, I have been unable to decipher the Profession, Trade or Employment of Joseph Green in the 1841 Census at St Clements, Cornwall, England. To me the first word has three letters and looks a bit like "Pre" while the second looks like "MJ". The 1841 Census Abbreviations of Occupation have M. = Manufacturer and J. = Journeyman but that seems to be an odd combination. Has anybody seen and deciphered a similar occupation or would like to offer their thoughts on what this one is? From other information his father Francis was a Butcher/Farmer and the occupations of his brothers were: Tailor (John Soil), Painter (Francis) and Publican/Butcher (Henry) so I suspect the occupation may be somewhere within the vicinity of one of those. The entry is best transcribed "Shoe M J", meaning shoemaker journeyman. First, remember that the documents we are looking at are the enumerators' books. The householder would have filled in a household schedule, much like we have for the 1911 census, and then the enumerator would transfer the information over to the enumerator's books. Exactly what was written on the household schedule we will never know. The householder may have written out Journeyman Shoemaker, which was then abbreviated as per the instructions to the enumerator. J. is the standard abbreviation for Journeyman. A journeyman had completed his apprenticeship but was not yet a master. This seems quite plausible based on the subject's age. The distinction between M. for manufacturer and m. for maker is a little less consistently applied, not least because it is sometimes difficult to tell whether the letter is capitalized or not. In this case, it does appear capitalized, but I would still suggest that the likely meaning is shoemaker rather than shoe manufacturer. Whichever is the case makes little difference in interpreting this occupation. I am a horrible reader of old hand writing but in 1840 there were still paper making guilds and making paper. My guess that first word is paper, So manufacturing of and I would guess that it means a Journeymen Mfg of Paper as mention in this Google Book reference., I saw some other references too.. Though based on your edit of it being a shoe maker occupation: This document lists occupations associated with shoe making and the granularity of detail provided in the different census years. Those that list a journeyman level include; Currier, Shoemaker (which maybe they just listed "shoe" with the Mfg abbreviatons such as mentioned in the above linked Wikipedia article "m. - Maker e.g. Boot m." instead of completing writing out "bootmaker" or "shoemaker". ), and Tanner that appeared on the 1841. though I fail to see any of any of those in the hand writing. I am confident you have also already seen this complete list of occupations from the 1841 census by area, though it groups all levels (branches) into a single category. 1861 Census (Menheniot; Class: RG 9; Piece: 1528; Folio: 61; Page: 24; GSU roll: 542826). For each his occupation is clearly written as Cordwainer. Reviewing the 1841 Census Record initially had me suspecting that the occupation written there is "Shoe MJ" i.e. shoe maker/manufacturer journeyman with the "oe MJ" easier to read than what precedes it but I think it is at least conceivable that it is "Sh". I've since found what looks like the same occupation for a Peter Jane a few pages later (see below) which is slightly clearer. I have paid heed to opposing comments by @ColeValleyGirl and @vervet as to whether it may be "Mf" rather than "MJ" and, although I have not been able to find a lowercase "f" for comparison on any nearby pages, I am going to conclude that it is "MJ". The reason for this is that the top loop starts from the right like a "J" rather than from the left like I would expect for an "f". However, the "bar" about a third of the way up does leave me with some doubt because that is more "f"-like. Also, there do not seem to be any periods placed after the "M" or the "J" but then, especially on the second example the "M" seems far from the "f". At the end of the day, for my purposes, whether it is "Shoe MJ" or "Shoe Mf" probably makes little difference, because either corresponds well with his later occupation of Cordwainer. Not the answer you're looking for? Browse other questions tagged 19th-century england census-records palaeography occupation or ask your own question. What would “F.S.” abbreviation mean on 1841 Census Record for Billin household in Helston, Cornwall? 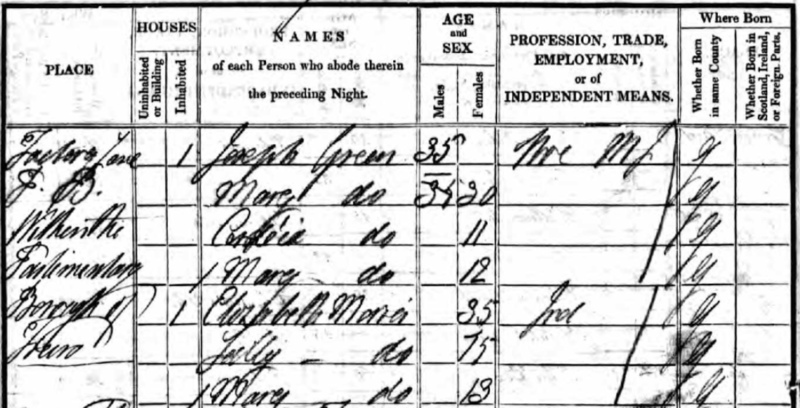 What does 1851 UK Census “Relation to Head of Family” entry that looks like “Depen” mean? What might Wine & Spirit Vaults be in 1841 Census at Helston, Cornwall? Finding late 18th Century service record of Francis Green in Cornish Militia? Deciphering place name in 1841 Census for Tavistock, Devon, England? What is this man's uniform and probable decade of photograph? What is this last name that looks like Kennet? What is Census occupation named Folder Work?